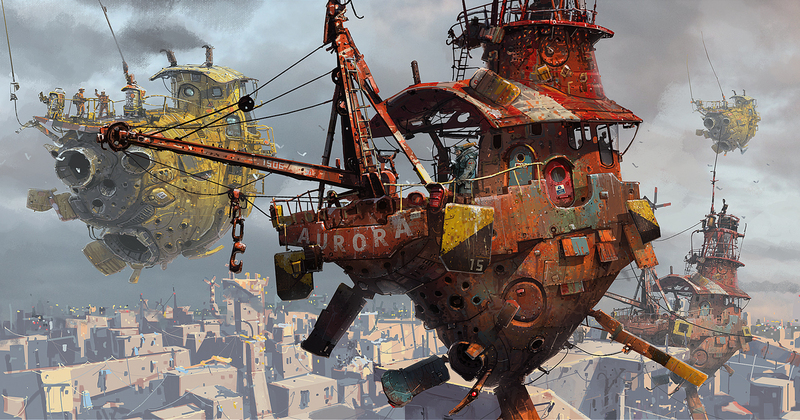 A quick interview of Ian mcQue, the Pope of concept art. Studied Illustration & Printmaking at Duncan of Jordanstone in Dundee, Scotland. Spent a couple of years doing the hard grind of freelancing before landing an artist position at game developer DMA Design which eventually evolved into Rockstar North, where I am currently Lead Concept Artist/Assistant Art Director working on the Grand Theft Auto titles. My first question is very banal. What influence you ? Where do your floating ships come from ? Like most people I don't htink I realised the job of 'concept artist' existed until I saw the work Ralph McQuarrie had produced for the original Star Wars, and in a way it was a job that hadn't really existed before that. I can remember filling page after page of my own ham-fisted attempts at copying McQuarrie's iconic character concepts and ship designs. A couple of years later 'Alien' arrived and that sealed it for me - this was what I wanted to do. I'm still amazed at the calibre of artists that was brought together on that film, and each one of them became a huge influence on me - Ron Cobb, Chris Foss, H.R. Giger and of course Jean 'Moebius' Giraud. I think the quality that runs through all of these artists' work that has inspired me most is the 'lived-in' feeling they bring to what they do - however far-flung the future they might be depicting there's always a functional quality to it, a humanity that makes it believable. 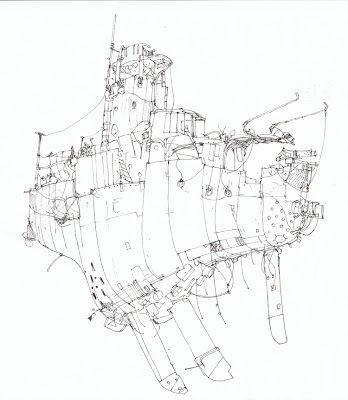 The floating ships that crop up in my work can probably be traced back to the motifs Moebius would use in many of his stories, but closer to home I think I must have been inspired subconsciously by the shipyards I grew up alongside in the North East of England. Seeing these great steel hulks being welded together in vast dry docks must have had an impact. Beyond that there's just a fascination with the implausability of seeing mammoth hunks of metal hanging in mid-air - as soon as that happens I find they and the world around them become heavy with possibility. I only know you digital works. Do you sometimes paint with traditional mediums ? I do paint traditionally, yes, although I don't seem to find the time to get the paints out as much as I'd like these days! When I do get the opportunity I prefer to use acrylics on canvas - I don't have the patience that oils demand. My canvas paintings are usually quite abstract in nature. It's a chance to focus purely on colour, tone and composition and what I learn here does feed back into the digital work. Also, being freed from the tyranny of the 'ctrl - z' option is hugely liberating and teaches you to be more confident in the choices you make while painting and to use 'mistakes' to your advantage. Which softwares do you use ? My main tool is Photoshop (cs5 right now). I also use 3d Studio Max to build and light scenes using fairly simple geometry that I then employ as a guide for painting over. I'll sometimes use the Brushes app for iPad to produce colour sketches that I'll later work up in Ps. You do impressive sketches. I mean, it looks so easy when I watch you videos. Could you provide us some tips ? Sketching lies at the heart of pretty much everything I do. I don't think the importance of good drawing skills can be overstated. Always carry a sketchbook and something to draw with, and draw all the time. Draw from life as much as you can. Join a life drawing class, or just find an unobtrusive place to sit in the street and draw passers-by. Whether you're drawing a goat's skull or a galaxy-spanning spacecraft the thing that's going to make them look convincing is how their form is defined by your understanding of light and shade so always be observing the world around you, be inquisitive and record what you see. I'm very curious about your coloring process. Could you explain us how you proceed ? My colouring process is fairly straightforward - I'll usually start with the composition sketched out as line art, then over this I'll add a mutiply layer onto which I'll block in the colour pretty rapidly, sometimes flooding the layer with an overall colour to begin with to provide a 'key' before I begin. It's akin to traditional painting I guess. Once I'm happy with the palette I'll add a normal layer on top and continue refining and firming up the elements of the composition using the still-visible line art layer as a guide. I suppose what I'm doing here is indicating forms using blocks of colour rather than outline - it's here that the image shifts from 'cartoony' to realistic, and I'll turn off the line art layer at this point. (I've a series of tutorials that explain my process in a lot more detail in the next volume of Digital Painting Techniques which is out in September). 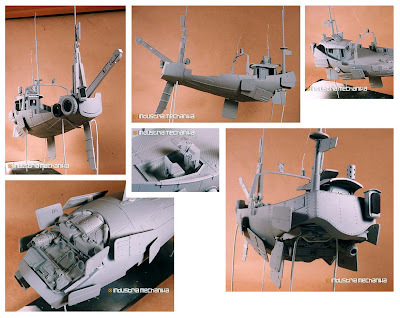 Industria Mechanika did a model kit and several figures from your concepts. Are you satisfied with their products ? Absolutely, working with Michael Fichtenmayer over at iMech has been nothing but a pleasure. I'd been a big fan of Michael's work before he approached me with a view to collaborating so it was a no brainer to get involved. The attention to detail and quality he aspires to is truly amazing, I couldn't be happier with how the finished kits have turned out. I'd always been a keen modeler as a kid (Tamiya, Airfix etc) so to get the opportunity to be involved with something like this was a dream come true. Keep an eye on the iMech site - some very exciting releases scheduled from a lot of the best concept artists around today. A question for my students (they're all great fans of your work) : What advices could you give to a young concept artist ? I think the best advice I could give is tied in to the response I gave earlier about drawing - you want to make your work look better than the other guy's so going the extra mile with the drawing practice is always going to help your work to stand out. Also, I look at a lot of portfolios/galleries online and I'm not sure I need to see any more orcs, wizards, space marines etc. Again, your work will stand out if you show something new and different, or if you can approach a cliched subject from a different angle. Another thing would be to try to have as wide a field of reference as possible. By this I mean it's good to know what's happening curently in games, movies etc, but don't dismiss the rich history of art and literature. There are many giants whose shoulders we can stand on... Finally, try to get to grips with some basic 3D modeling (these days it doesn't have to cost much; Google Sketchup is excellent and available for free). It's good to have as many skill sets as possible and a lot more companies are looking for concept artists with this in their locker. Oh, and it makes perspective *so* much easier! 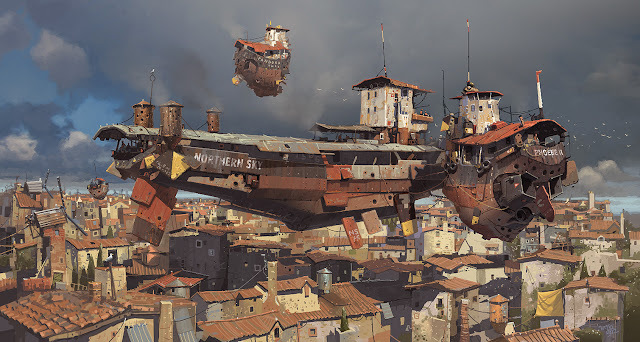 Last question (whispered by Jeff Simpson) : Any chance to see a game based on your personal work ? Well, I certainly wouldn't rule anything out. And I'm open to offers...!